There are plans for housing at Forth Park. A public exhibition on plans for around 55-60 houses on the site of a former Kirkcaldy maternity hospital is taking place in the town next week. The information event is inviting people to view proposals for a residential development, access road and landscaping at the former Forth Park Hospital in Bennochy Road. The pre-application consultation is being held by AEL Developments Limited and NHS Fife who are giving notice of their intention to submit a planning application for the site. The display is on Thursday, March 22 at The Steadings in Bennochy Road from 2.00 to 8.00 pm. The property has been vacant since the buildings were cleared of all medical and office equipment after it closed in January 2012. Various attempts to make use of the existing buildings – including the B-listed mansion house building and separate B-listed stable block – have come and gone. The hospital and its grounds were previously marketed with the benefit of conditional planning permission in principle for 69 homes, but that permission has since lapsed. The current proposals are looking at building 55-60 houses. 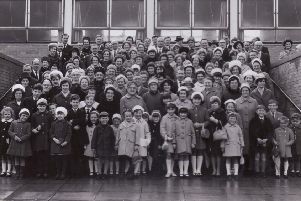 Forth Park had supported women giving birth since 1932 but stopped admitting expectant mothers at noon on January 9, 2012, when maternity services officially switched to Kirkcaldy’s Victoria Hospital.